Today I planted the last set of bulbs ready for next Spring and breathed a sigh of relief. I love Spring bulbs like the next gardener but planting them just isn’t my favourite task. I only realised this some years ago when I was dutifully scrabbling around in the dry earth of September desperately trying to force into the ground some 200 bulbs that I had succumbed to in a rash moment when reading a ‘free’ offer in a magazine. My next door neighbour called round and remarked that he disliked bulbs because planting them was hard work and boring. I remember pausing at that moment and thinking, he’s right! Early September brings the best bulbs into the garden centres but the ground is either too hard and dry to plant them or covered in late summer flowering gems. And then there’s the dilemma about tulips. All the advice points to planting them in November to reduce the potential for disease but if you leave purchasing your tulips until then, you will have very slim pickings in the garden centre which by this time will be full of Christmas decorations! 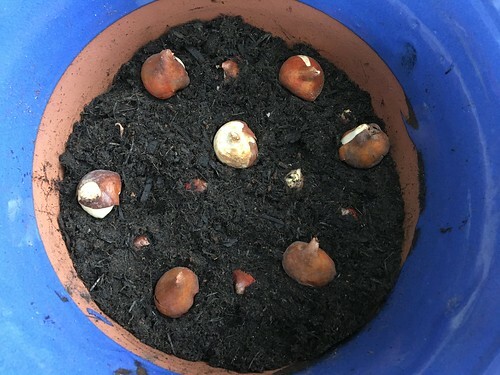 Store your tulip bulbs carefully and, by the time you are ready to plant them, chances are they will already be sprouting or some will have gone soft! This autumn I wanted to plant yellows, oranges and reds in my ‘hot’ border but held off until last weekend as it was, to my delight, still flowering profusely. The arrival of our first frost on 1 November gave me the cue to bring the dahlias back down to ground level and to remove any remaining annuals. Heavy rain the night before fooled me into thinking bulb planting might be easier but no, the dahlia leaves had well and truly prevented too much water reaching the soil. I chipped away at making suitable holes and eventually shoe-horned in about 30 bulbs, thereafter retreating indoors with what can only be described as ‘bulb-planting wrist’. Today I decided to take the easy option and to plant my remaining tulip bulbs in a pot. 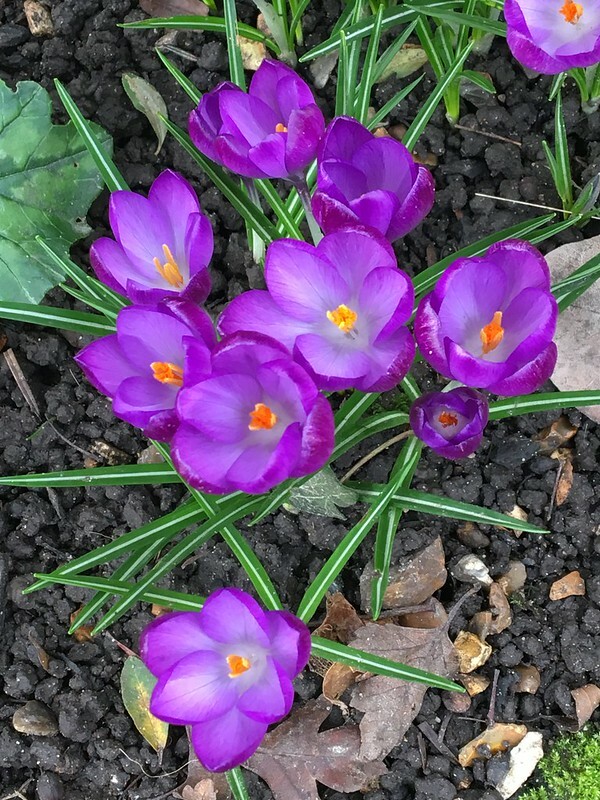 Having purchased a pack of orange and purple bulbs shown flowering beautifully together, I was surprised to discover that they were likely to flower at slightly different times. So I have planted the earlier ones deeper in the hopes that they might all flower together. Having prepared my pot, I think had to think about squirrel defences. Having chopped down my dahlias last weekend and mulched them heavily, today I see that the squirrel has thoughtfully spread my mulch all over the lawn! I have found that both plant supports and upside down hanging baskets fulfil a useful anti-squirrel function. And so, as I sit back and wait for the joys of Spring and bulbs in all their glory, I spare a thought for those professional gardeners and volunteers who bring amazing displays to us every year, such as the one below at Wisley earlier this year, and I’m just grateful that I only had a few packets of bulbs to plant and not a few hundred or thousand! Categories: Blog post | Tags: Bulbs, Crocus, Daffodils, Tulips | Permalink. 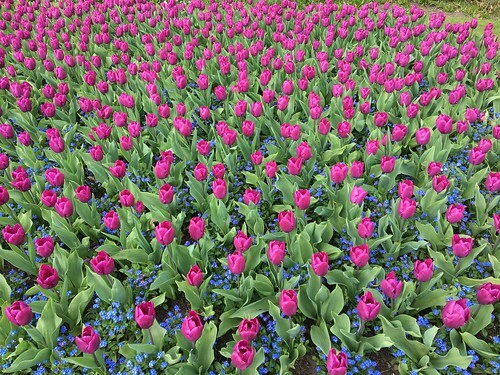 Another dry spring appears to have produced an especially vibrant performance of early tulips. However, a recent visit to RHS Wisley reminded me that my offerings on the tulip front are a little mediocre! I have often been frustrated by tulips and their rather temporary nature – here one year, gone the next. I dislike fishing them out of a pot after flowering only to discover that they have split into several bulblets and it’s hard to know what is worth keeping for the following year. I guess that’s partly my own fault for only planting them in pots as, once they are over, I’m ready to move on to the next season’s planting. That said, over the past couple of autumns, I have deliberately planted more tulips to bridge the gap from the daffodils going over and the summer border coming to life and this year I have been more than pleased with the results. 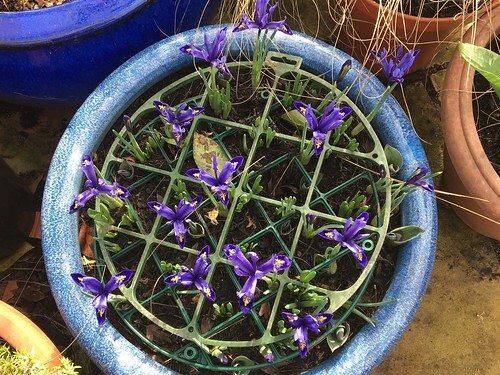 Having seen it recommended in many a gardening magazine, programme and blog, I planted up two bulb lasagnes – tulips deep do wn, miniature daffodils in the middle, and iris reticulata for the top early layer. One of these pots I kept simple and only planted the bulbs, covering the top with an old upside down hanging basket in an attempt to stop the squirrels re-planting the bulbs elsewhere! 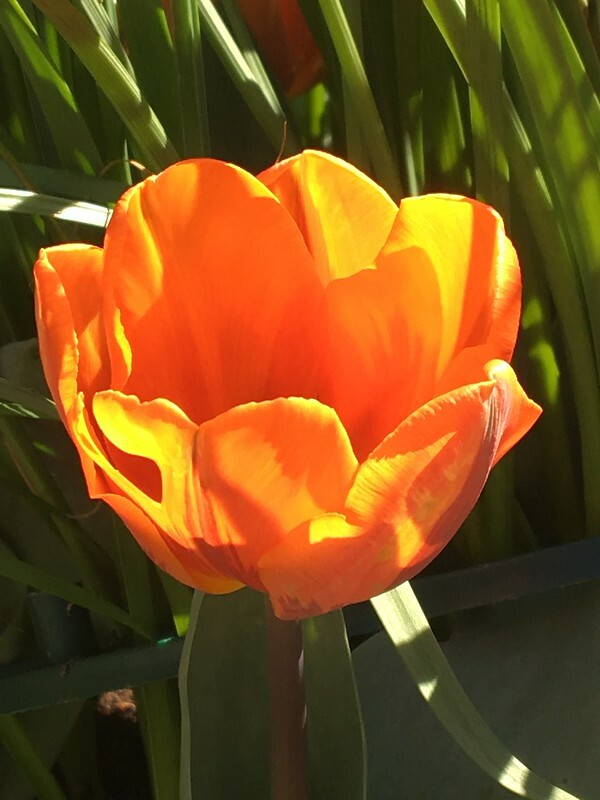 As I glance outside the backdoor, this particular pot is just coming to its end with the final flourish of fiery orange and red tulips glowing in the sunlight. I was more ambitious with the second ‘lasagne’ as it was going into a particularly large, deep pot which meant I felt that I could get away with an additional winter layer comprised of wintering flowering violas and some variegated trailing ivies. Having read the recommendation to plant variegated ivy to brighten dark areas, I delibe rately chose a variety with white / silvery edges which shone through the winter and which I intend to plant out at some point down the far end of the garden where it is incredibly shady and ivy is one of the few things that grows successfully. My thought is that I can at least brighten up this area with the paler leaves. The bulb leaves are now starting to die back and I am wondering whether I can carefully over-plant something for the summer without disturbing the bulbs beneath? I have never really planted tulips in the border as I’ve always read that they don’t really come back and you need to replant every year. However, I’ve noticed that my neighbour’s red tulips return to his border faithfully every year; and next-door-but-one threw in loads of red and orange tulips about three years ago and they have come back successfully. So last year I decided to ignore th e advice and attempt to naturalise some tulips in the border and, in particular, some rather stunning purple tulips which had flowered at the same time as the bluebells. 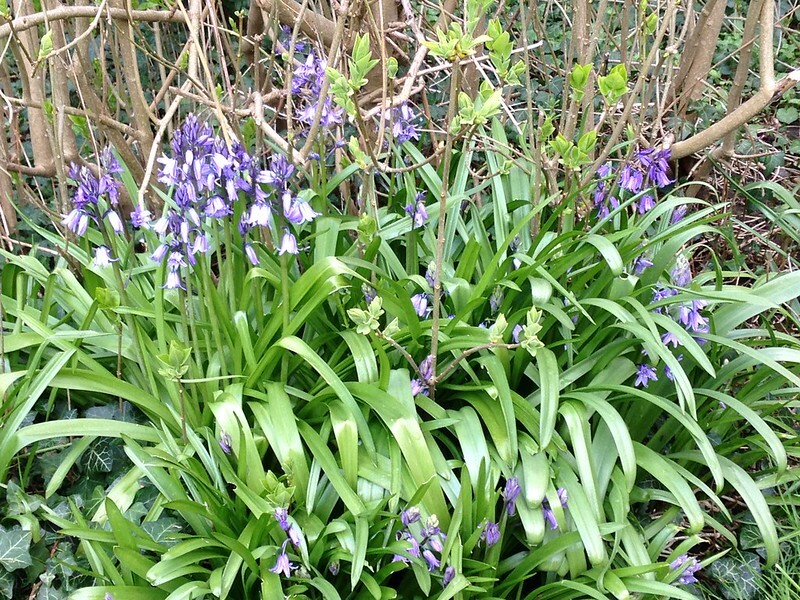 I could see that they would make a fantastic combination so, instead of leaving them in the pot or lifting them to dry and then be lost at the back of the shed, I decided to transplant them to an area of border directly behind a huge clump of bluebells. To my amazement they have returned this year with some vigour but, guess what? 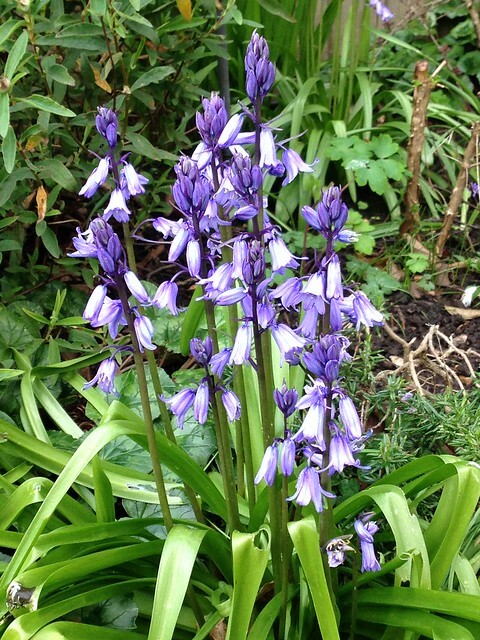 They have flowered at a different time to the bluebells! I guess you can’t win them all! Categories: Blog post | Tags: Bulbs, Pots, Spring, Tulips | Permalink.